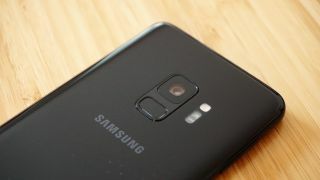 The Samsung Galaxy S10 could be one of the next major flagships to land, so unsurprisingly leaks are starting to build and today a number of details have emerged, including the possibility that it will have a "punch hole" style selfie camera cut-out. That claim comes from Evan Blass (a leaker with a great track record), who adds that this sounds like Samsung's recently announced Infinity-O display - and we can't argue with that. It's a display that has a camera cut-out towards the left edge, but unlike a notch, this doesn't extend from the top – it's surrounded by screen. It's also a claim that we've heard once before recently in relation to the most basic Galaxy S10 model, but it doesn't sound like Blass is talking about the basic model, as he also says that it has an ultrasonic in-display fingerprint scanner and three rear cameras, specifically a telephoto one, a wide-angle one and a standard one. Those are all rumors that we've heard before about the top-end Galaxy S10 model, with earlier leaks saying there would be a mid-range model with just two rear cameras, and a basic model which drops the in-screen scanner, has a flat screen and either one or two rear cameras. Blass doesn't say which model he's talking about here, but if there really are three then this is likely the top option. Finally, he adds that – unsurprisingly – the Samsung Galaxy S10 will apparently come with One UI over Android 9 Pie. One UI is an interface that Samsung announced recently, which is designed to make big phones usable with one hand by putting controls in the bottom half of the screen, with a viewing area at the top. It also sports things like large interactive icons and a system-wide night mode. We'd take all of this Samsung Galaxy S10 information with a pinch of salt, since nothing about it is confirmed yet, but Blass is a good source, most of these rumors have been heard before, and none of them are unbelievable.